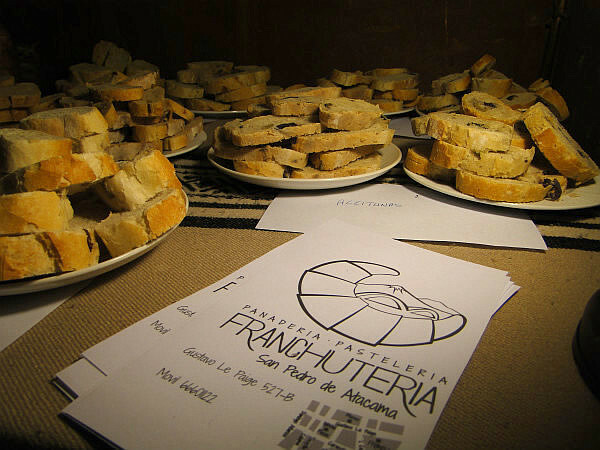 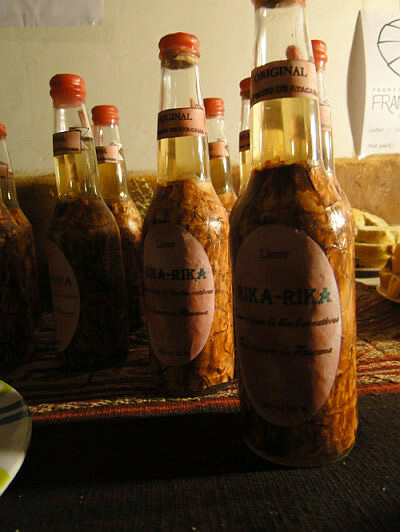 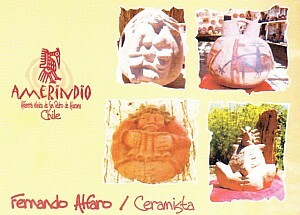 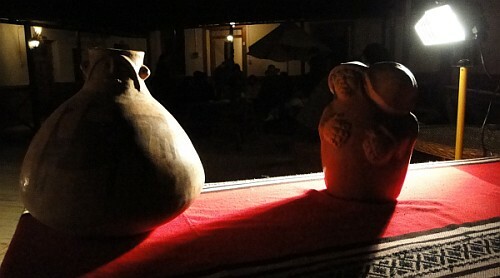 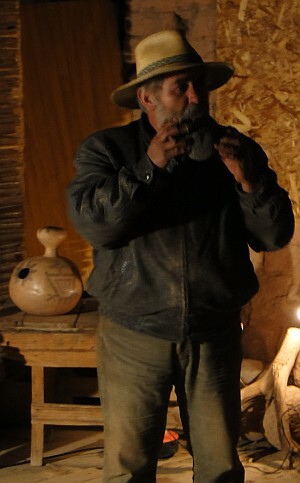 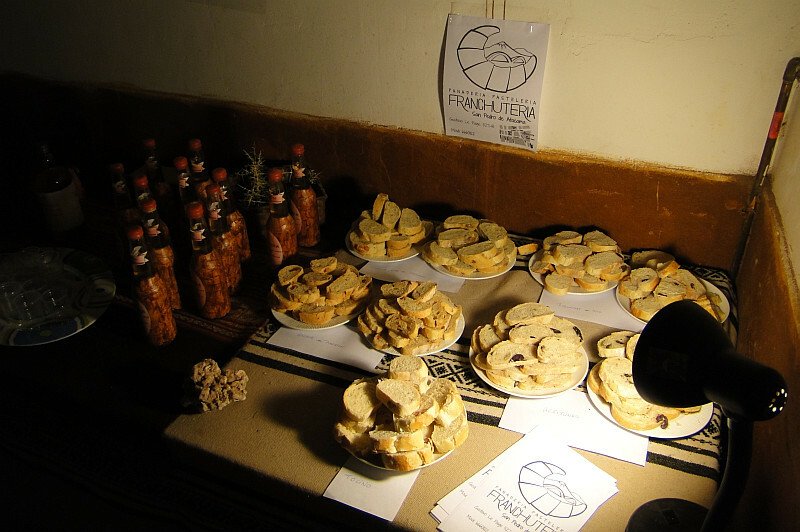 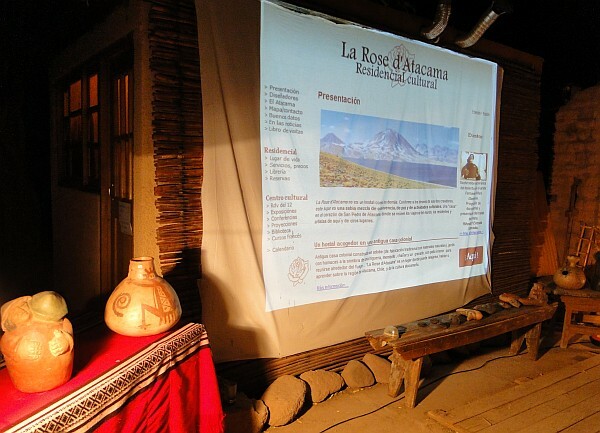 Degustation of artisanial products made in San Pedro de Atacama. 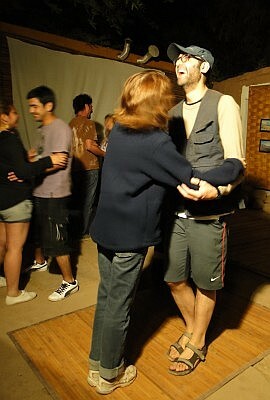 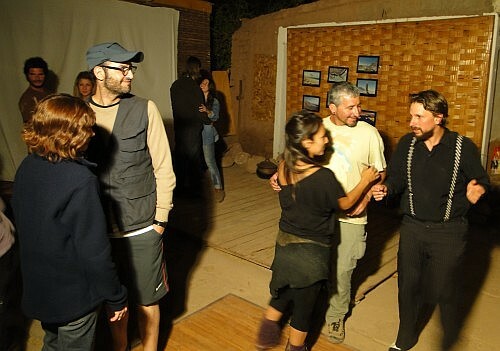 To discover the art of dance with Julia and Santiago from Buenos Aires. 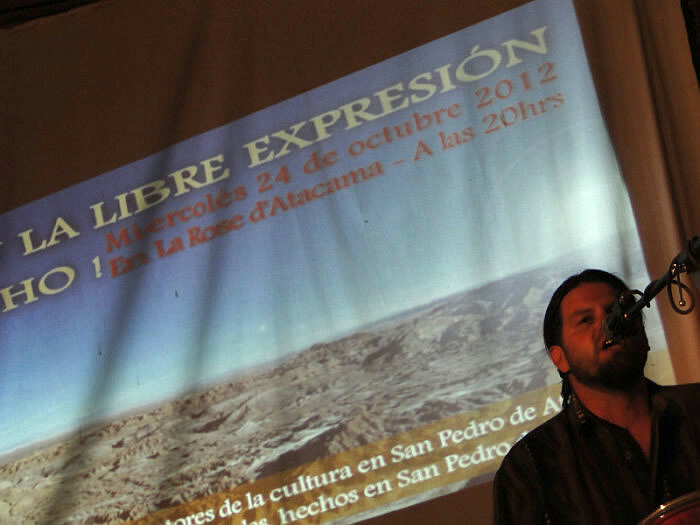 On the occasion of the 31th anniversary of the municipality of San Pedro de Atacama. 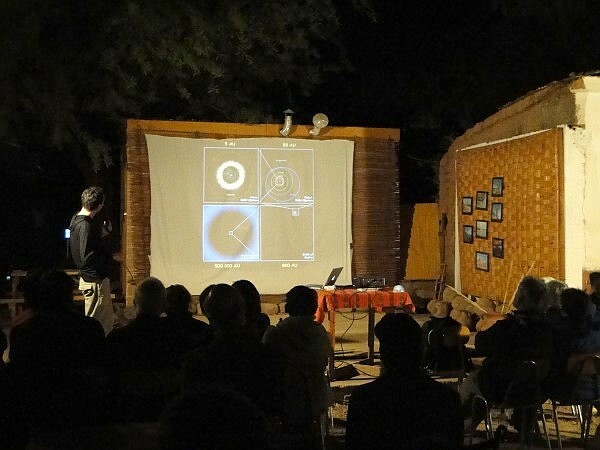 invite you for a cycle of conferences. 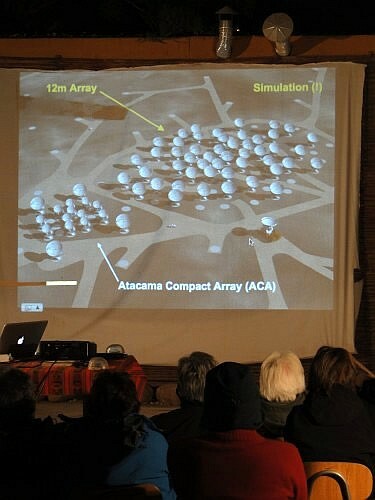 The ALMA observatory is the most powerful and complex radius telescope in construction in the world. 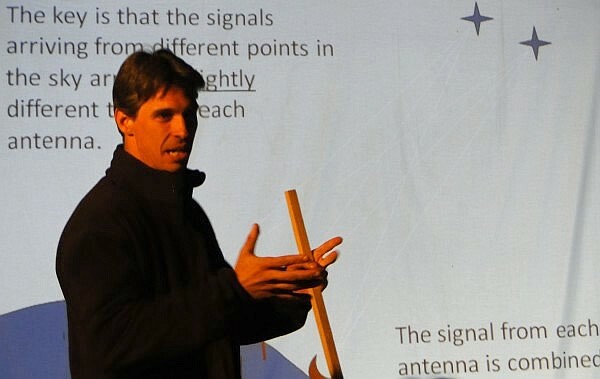 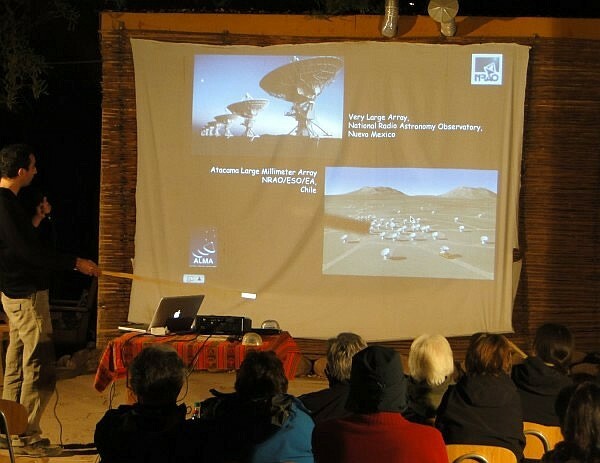 It will consist of 66 giant antennas installed in Atacama's desert (Chile), which will receive signs of different parts of the universe for the study and scientific research of astronomic phenomena. 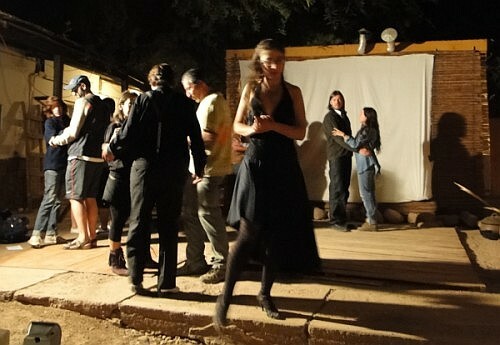 At 9PM // Free entrance. 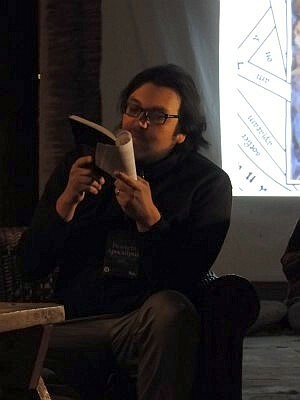 Thursday 17th of november 2011, at 9PM. 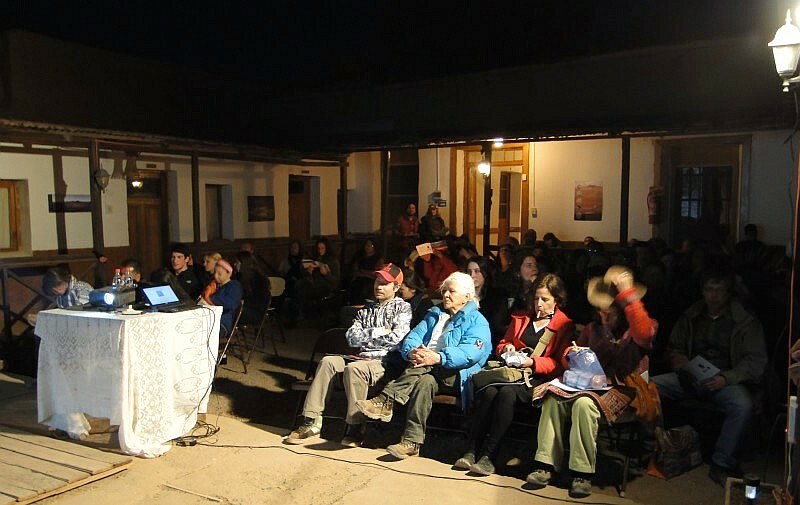 45 persons were at the first conference ALMA on the occasion of the anniversary of the municipality of San Pedro of Atacama. 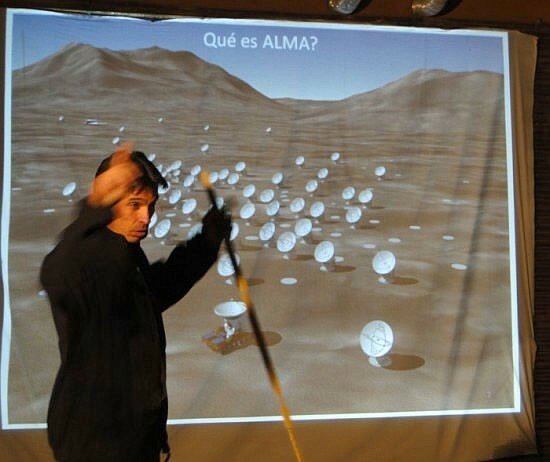 William Garnier (ALMA) for his confidence. 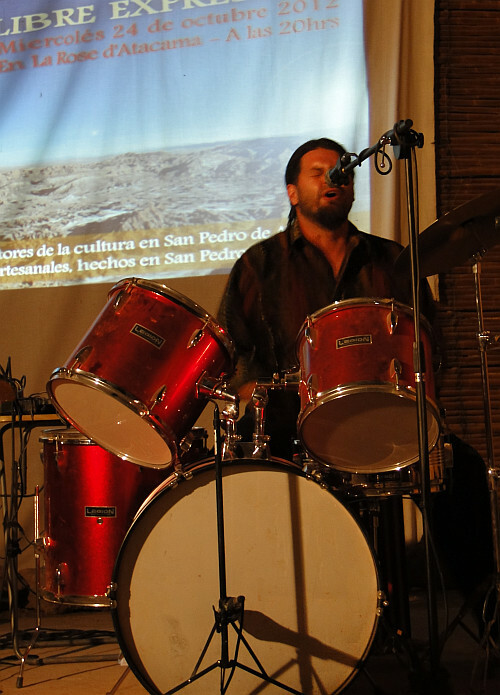 Daniel Fulla Marsa to have gived once again of his time and his passion during this conference. 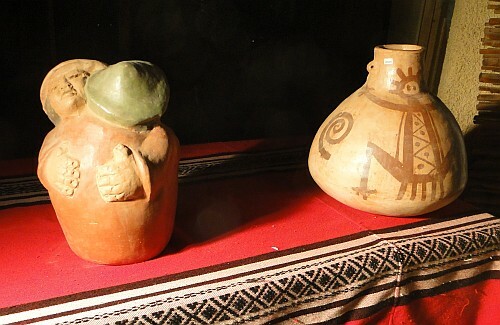 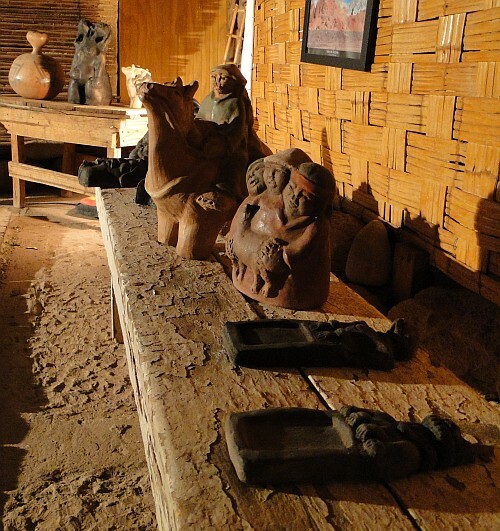 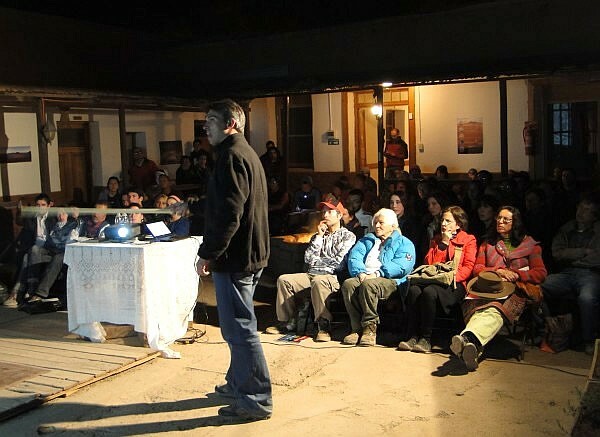 The archaeological Gustavo Le Paige museum and Universidad Catolica del Norte for the loan of chairs. 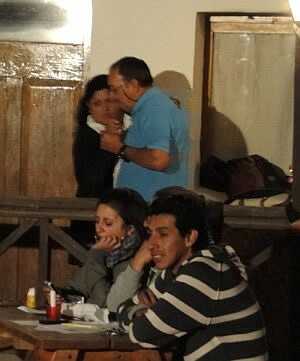 Wenesday 23rd of november 2011, at 9PM. 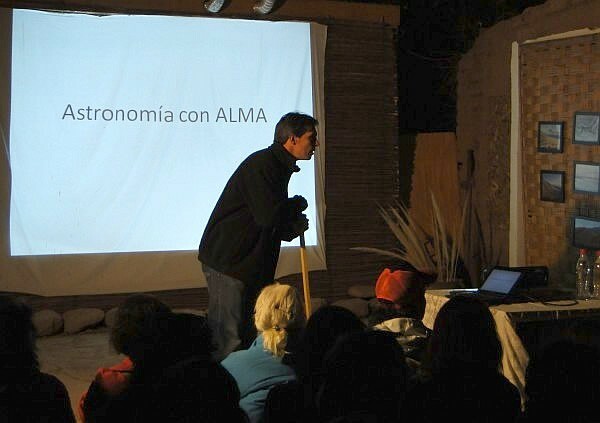 35 persons assist the second conference ALMA on the occasion of the anniversary of the municipality of San Pedro of Atacama. 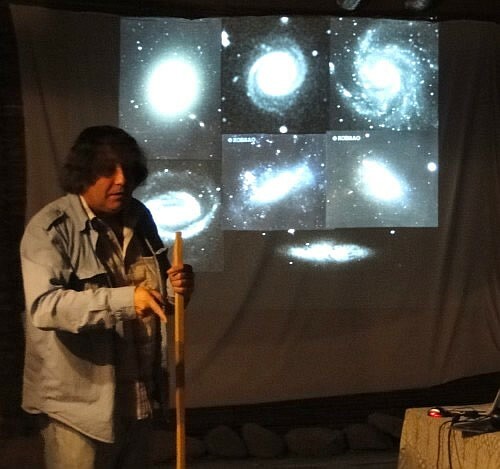 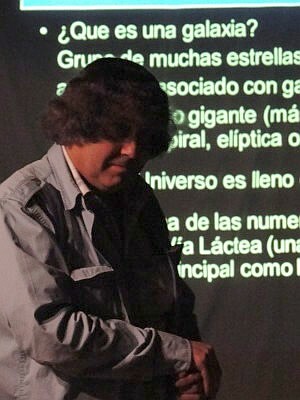 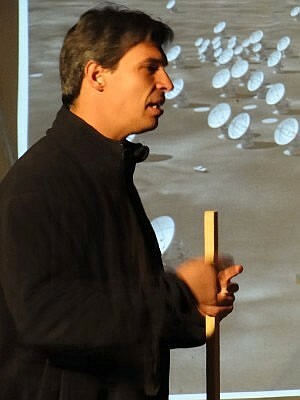 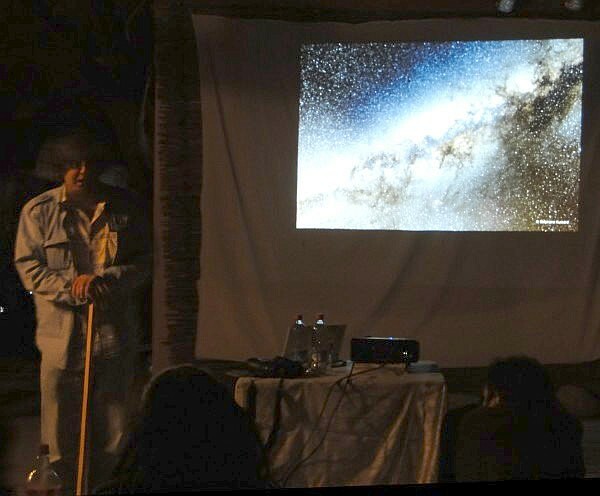 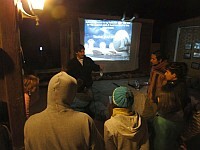 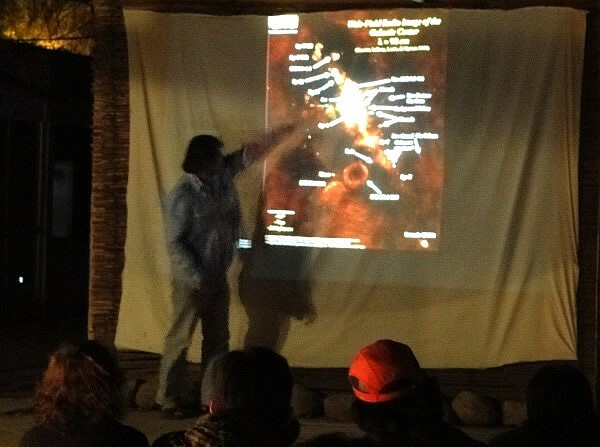 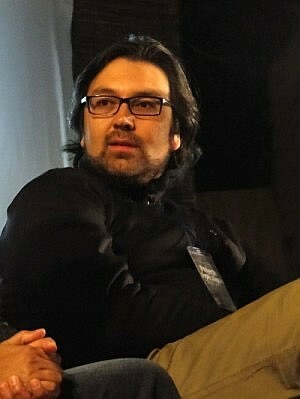 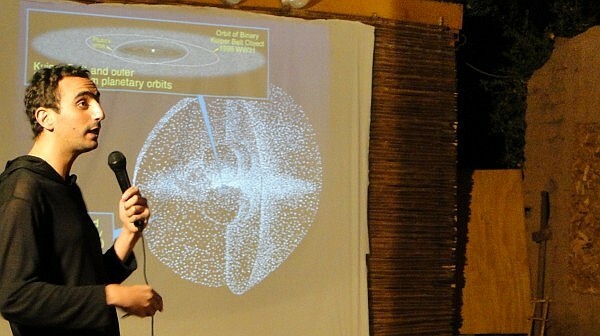 Antonio Hales to have gived his first conference at La Rose and very well represented the chilean astronomy. 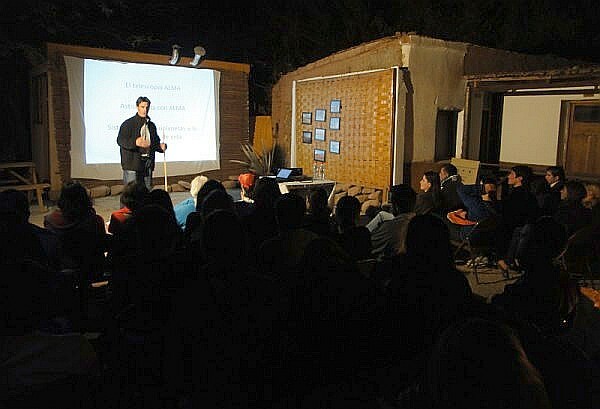 The Liceo Lickan Antaï of Sequitor for the loan of chairs. 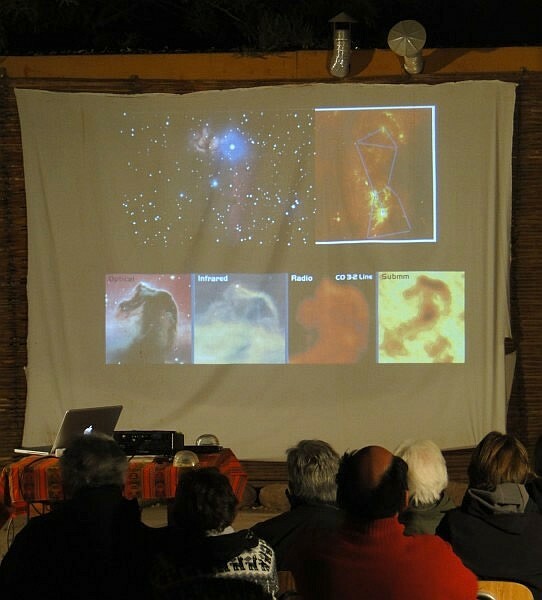 Astronomers' communities of the all world ara interested for the observations and ALMA's results to investigate fascinating topics as the stars, planets and galaxies formation, chemical and dynamic composition of the universe, the origin of life, etc. 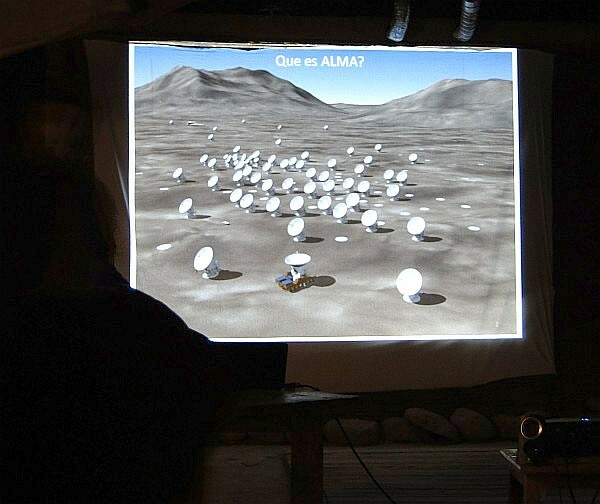 In a conference, it will be leaking out with more detail in what consist ALMA and the current works for its construction. 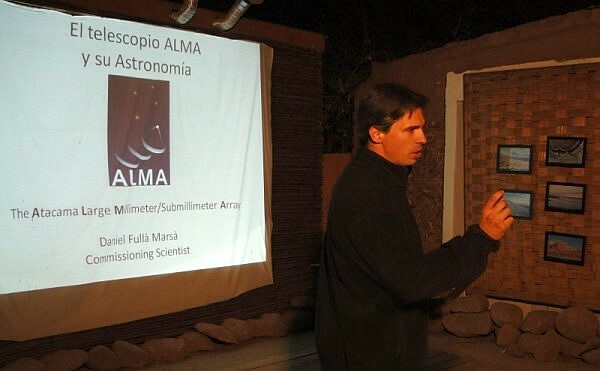 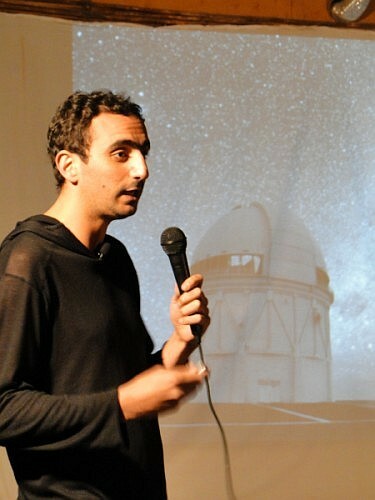 Then, Daniel Fulla Marsa will introduce the principal fields of astronomy for that ALMA has been designed. 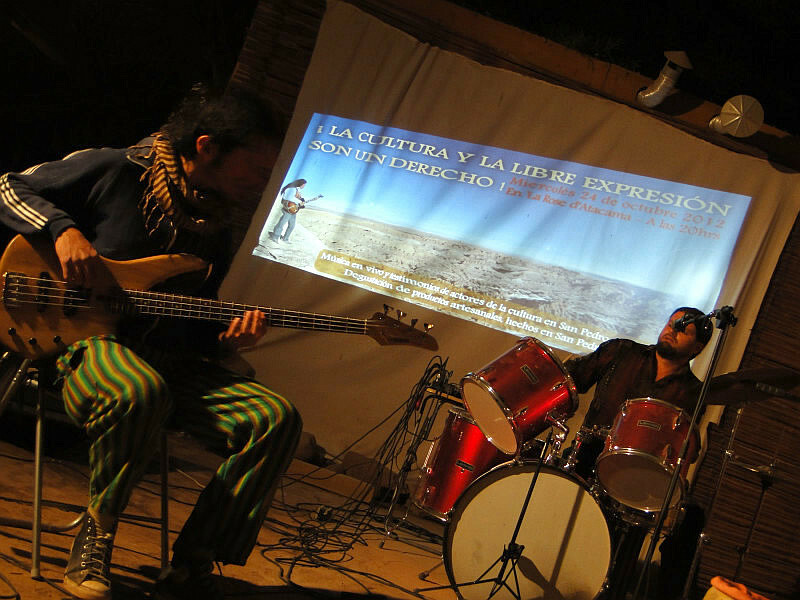 At 8:00 PM // Free entrance. 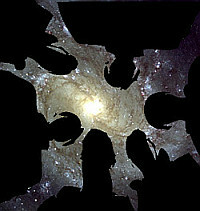 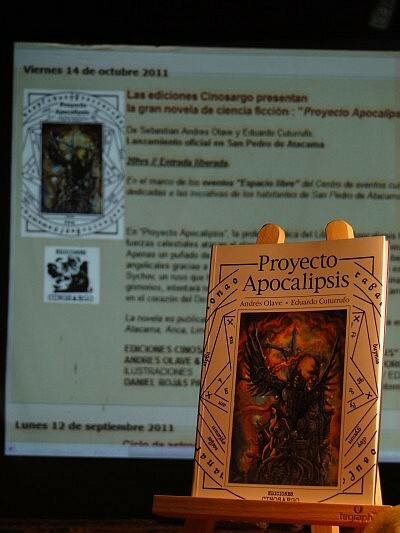 the science fiction novel "Proyecto Apocalipsis"
By Sebastian Andres Olave and Eduardo Cuturrufo. 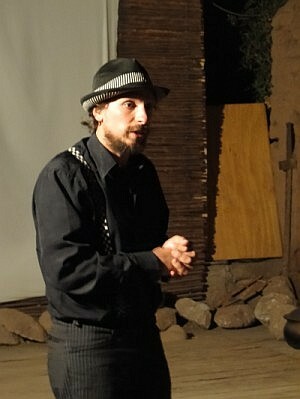 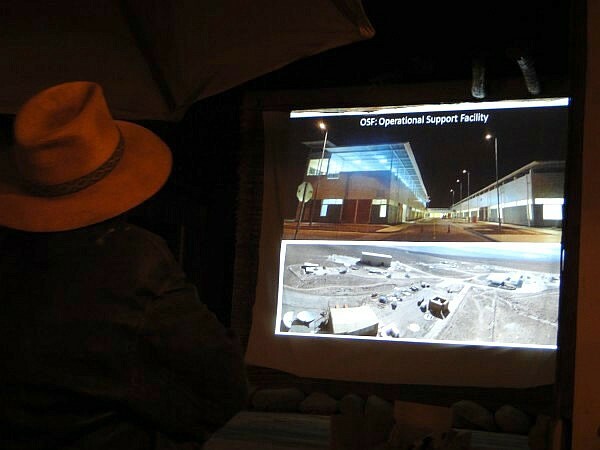 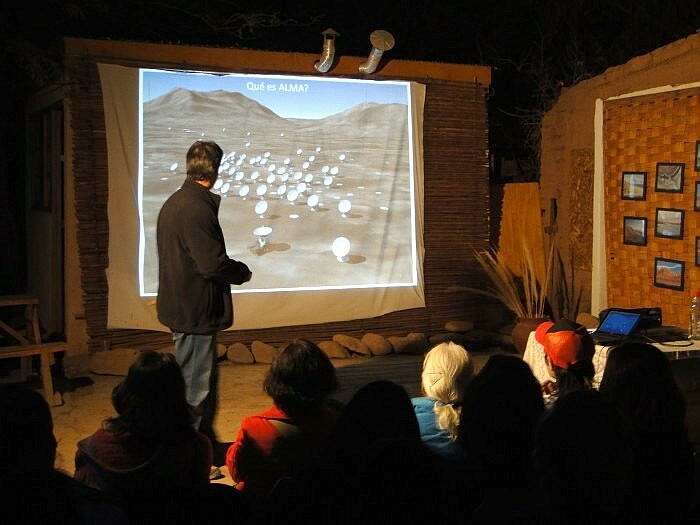 Official launch in San Pedro de Atacama. 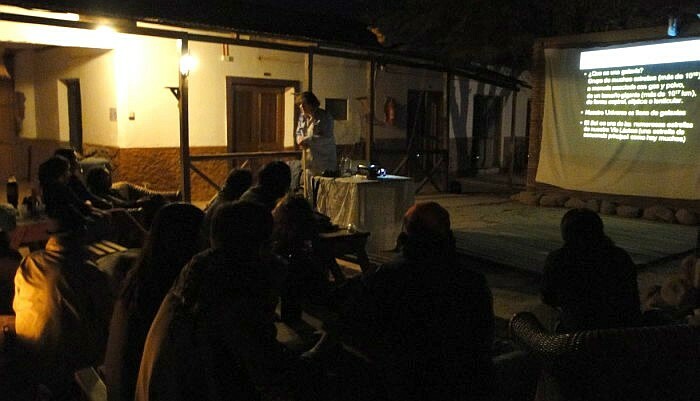 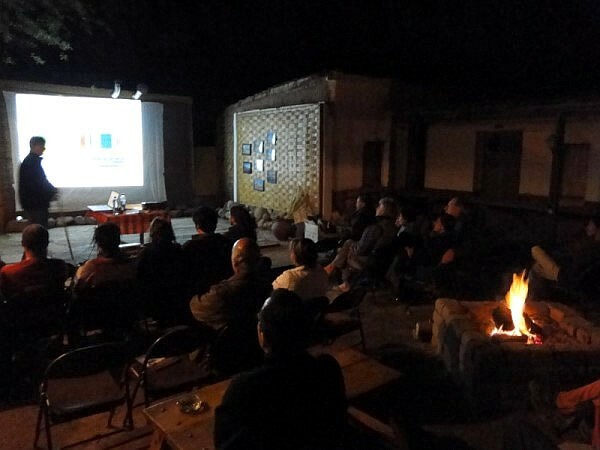 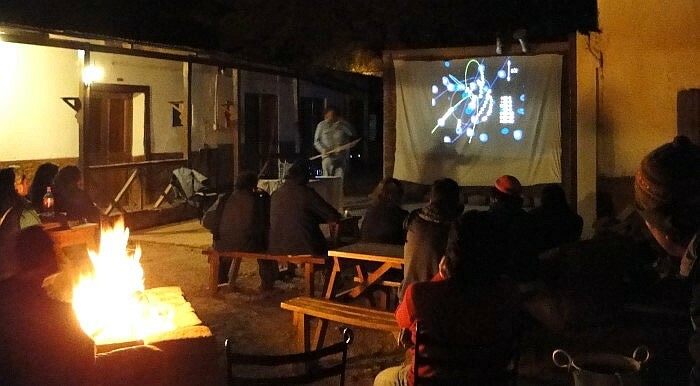 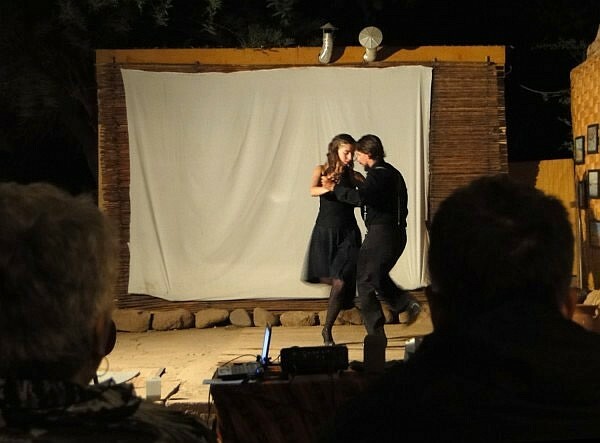 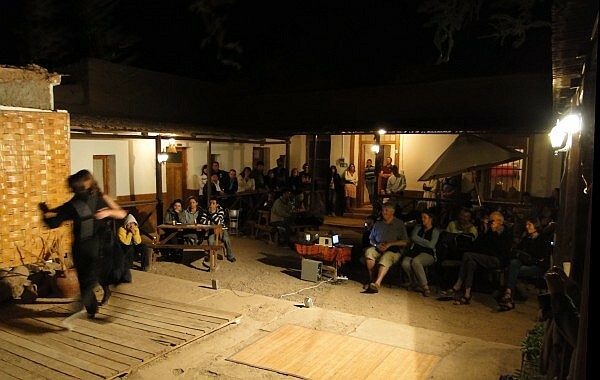 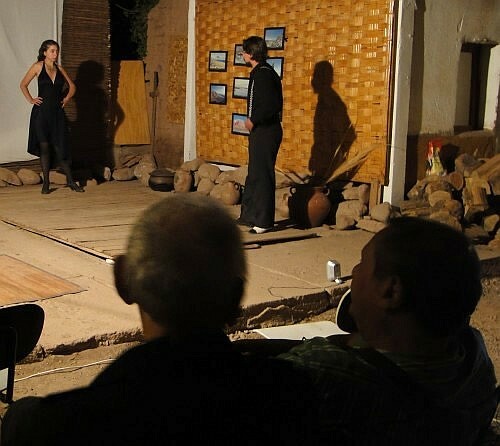 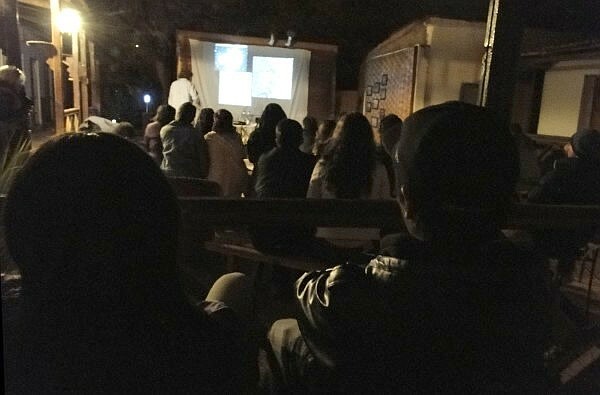 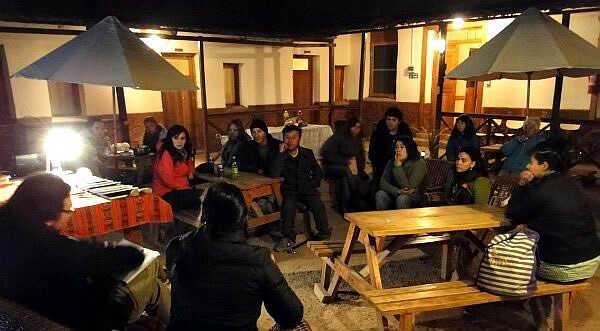 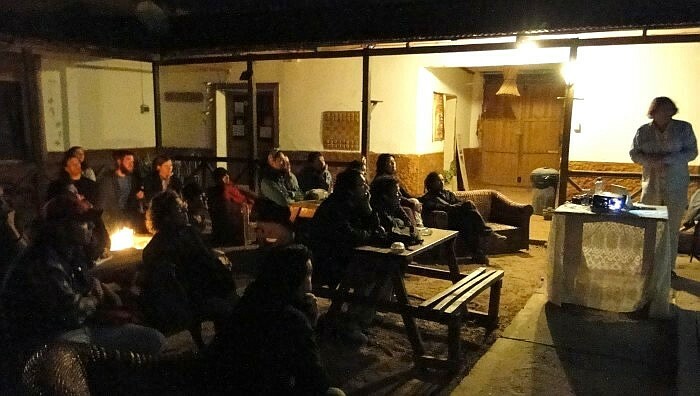 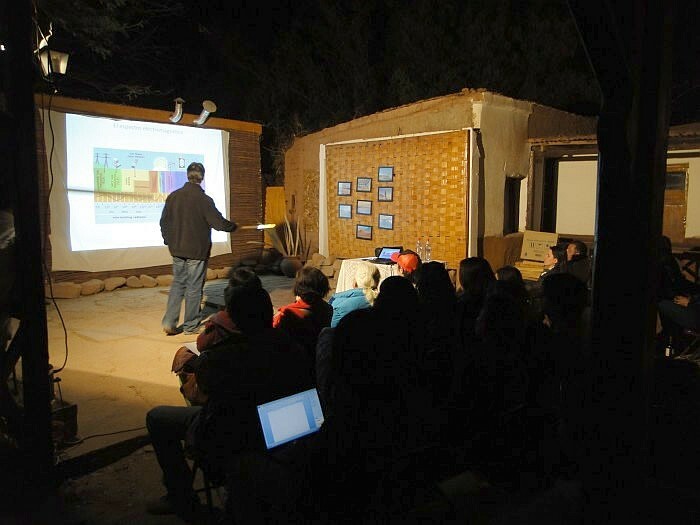 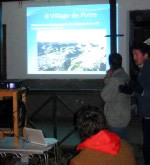 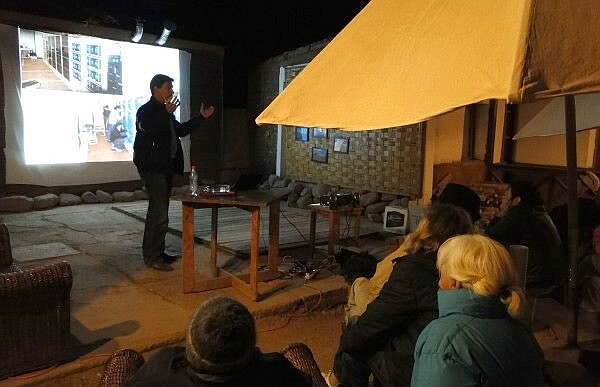 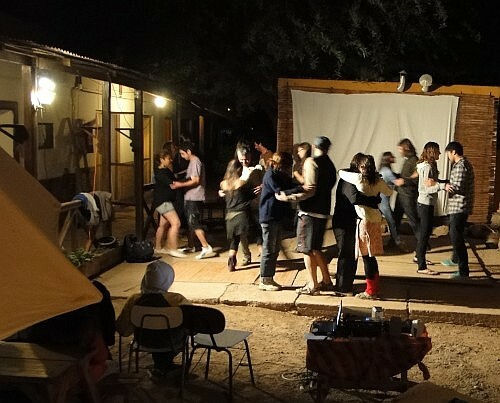 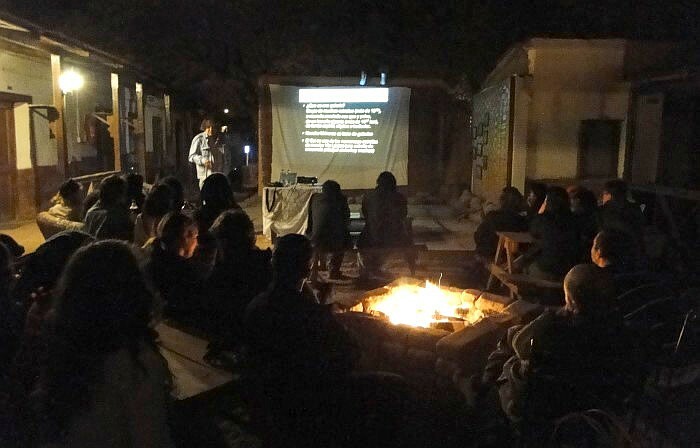 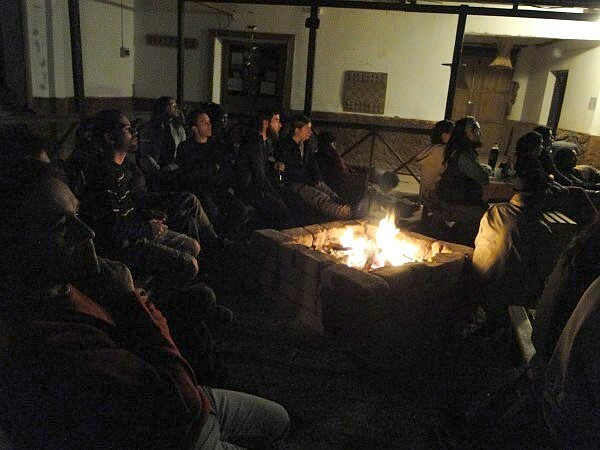 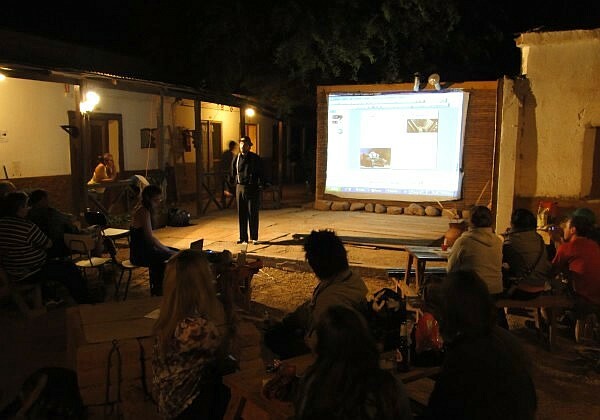 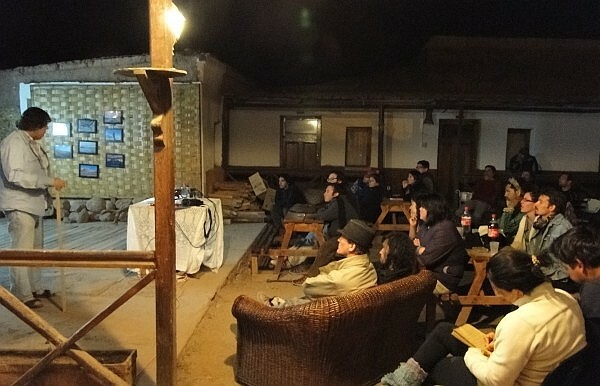 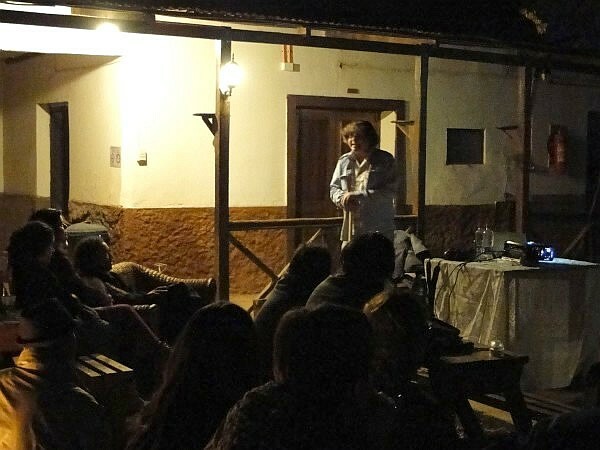 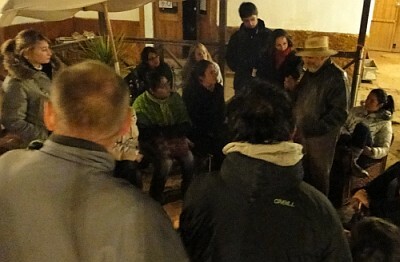 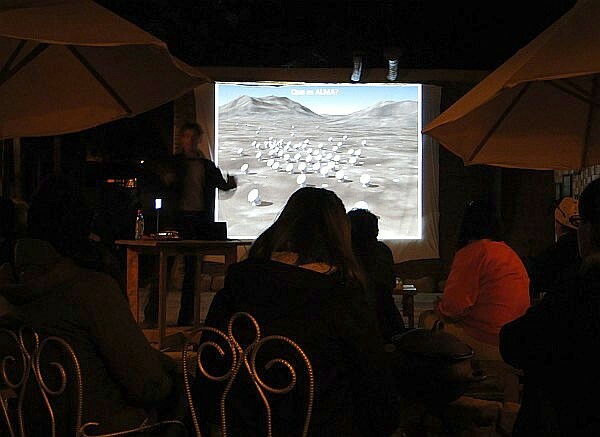 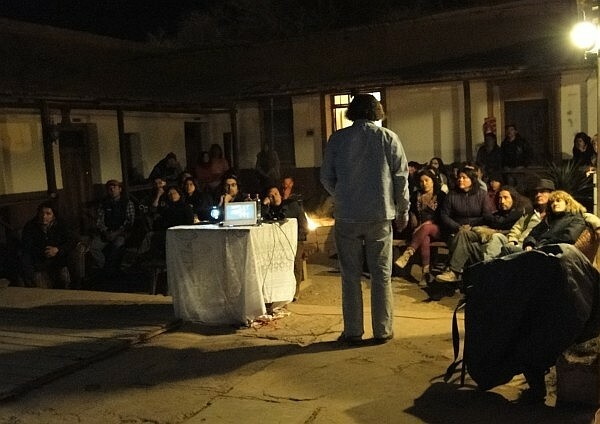 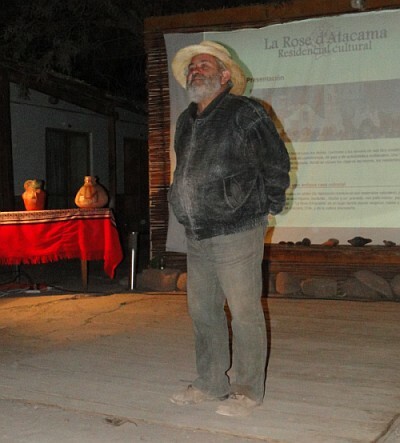 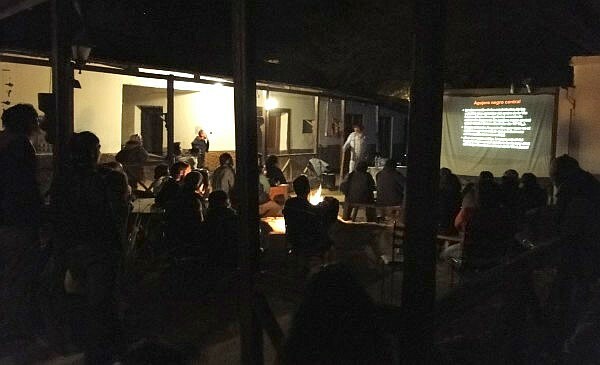 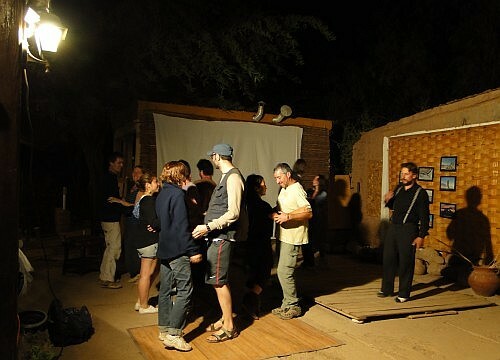 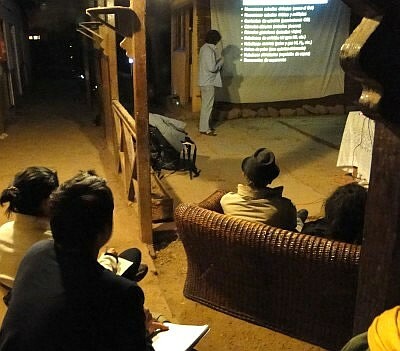 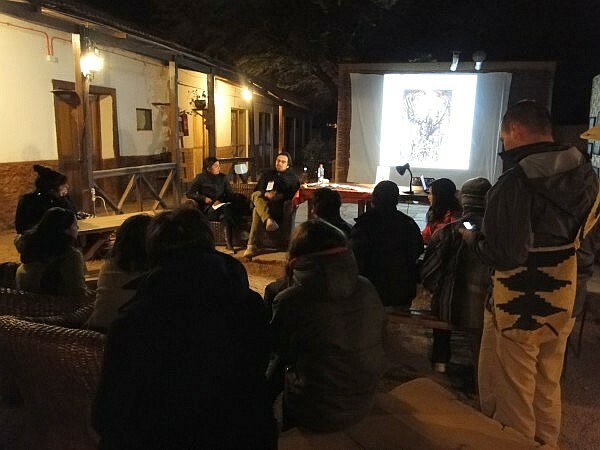 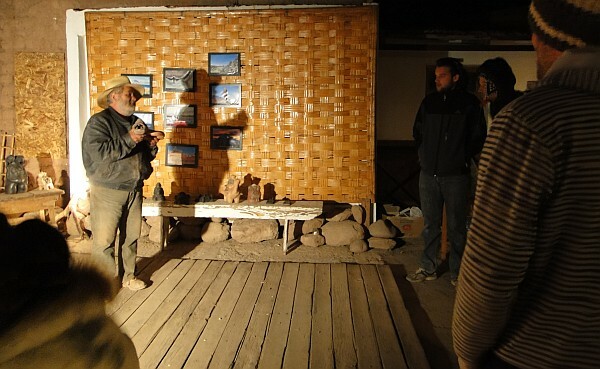 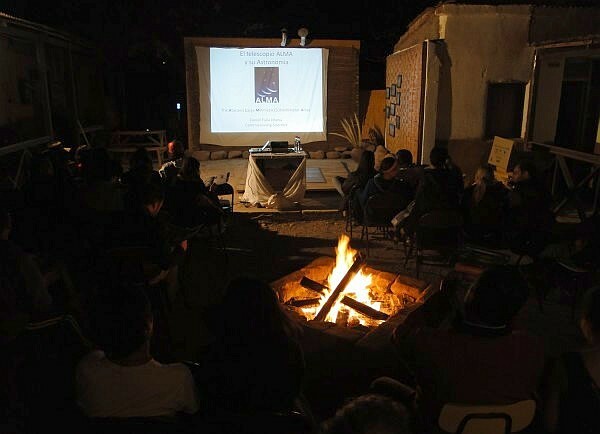 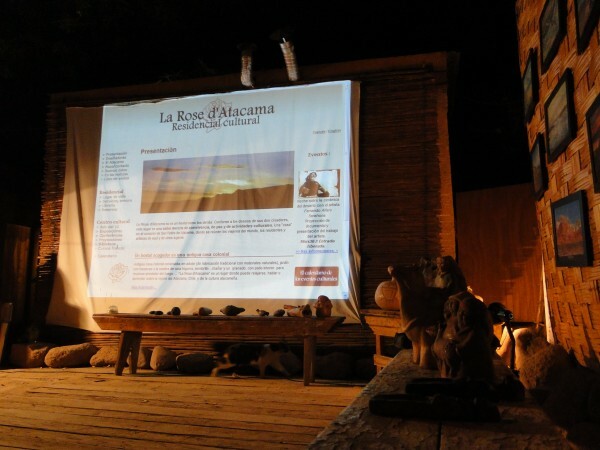 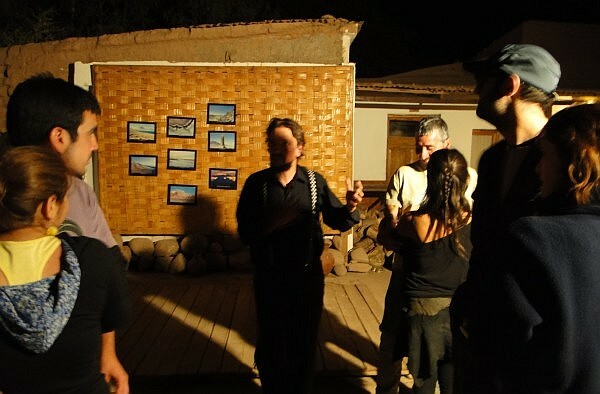 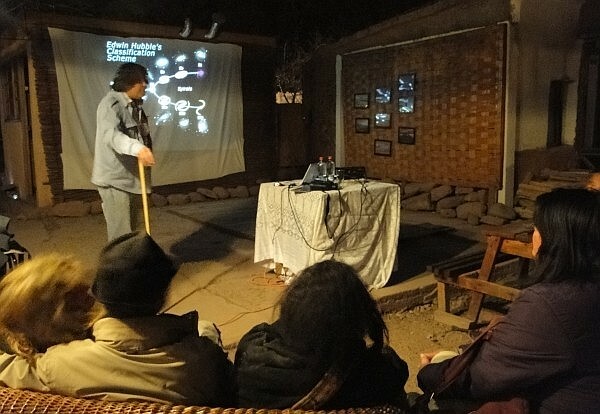 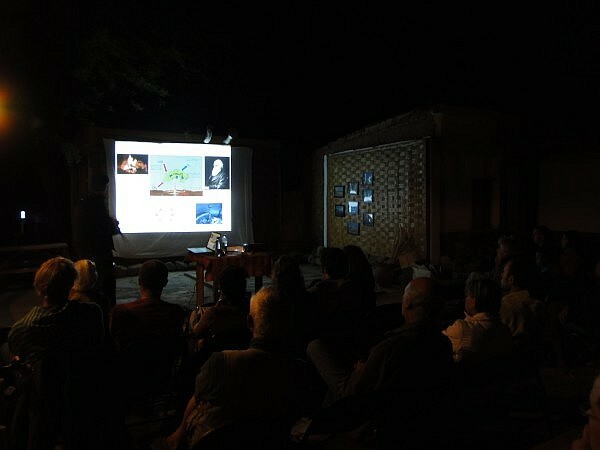 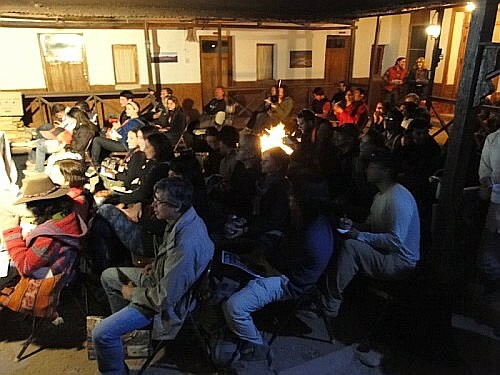 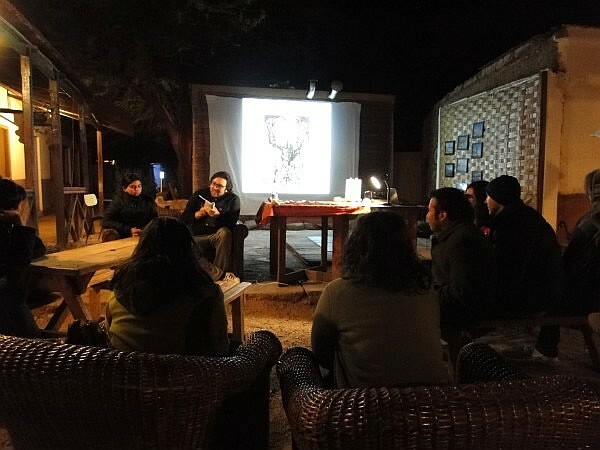 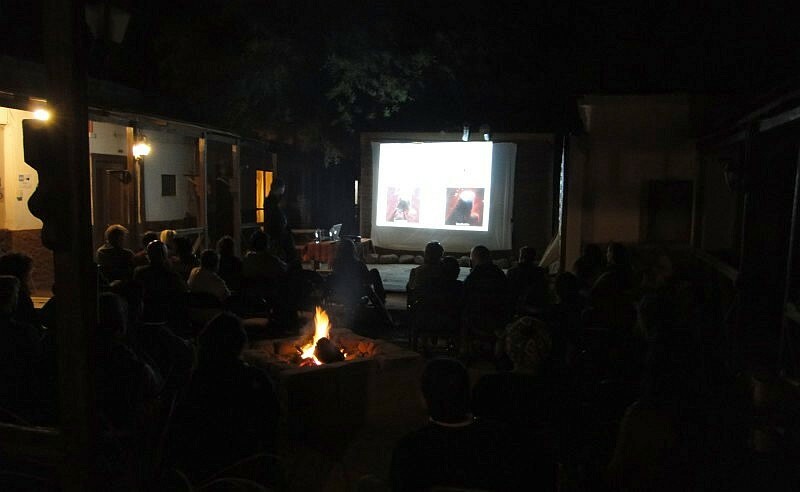 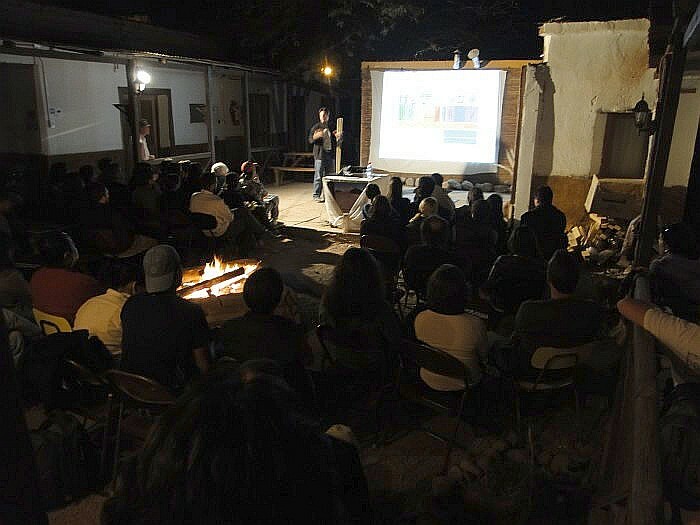 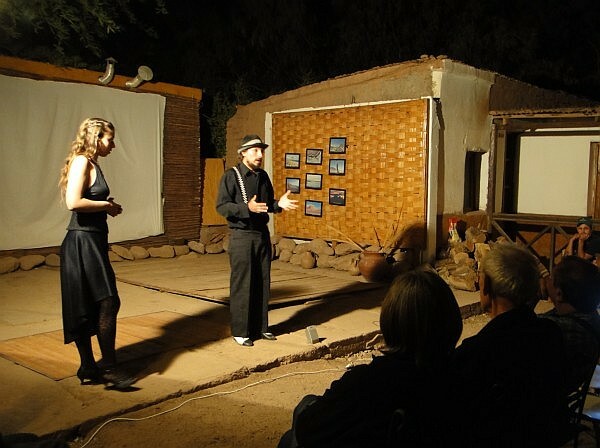 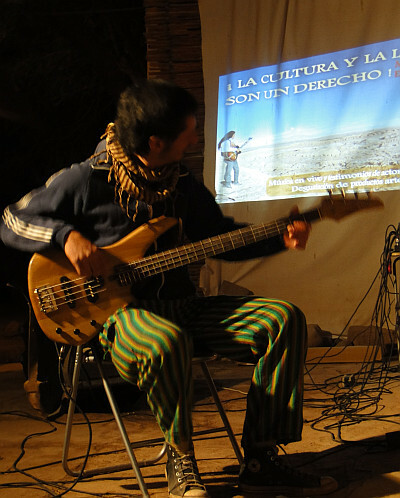 In the context of the "Espacio libre" evenings of La Rose d'Atacama, dedicated to the initiatives of the inhabitants of San Pedro de Atacama. 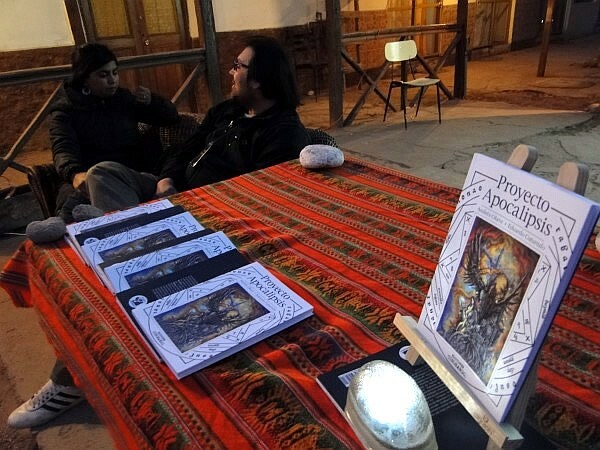 In "Proyecto Apocalipsis", the biblical prediction of the Apocalypse's Book occurs finally : the celestial strengths attack the earth. 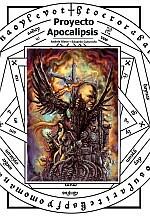 Hardly human beings' handle survive the attack of the angelic armies thanks to the magic and to the mystic powers. 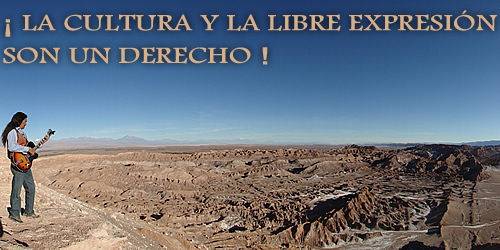 The human resistance is led by Koteopolus Sychov, a Russian who spent forty years in a small cave and who, having acquired the knowledges of the antique books of magic spells, will try to save her sister, Anna, prisoner in a concentration camp situated in the heart of the Atacama Desert. 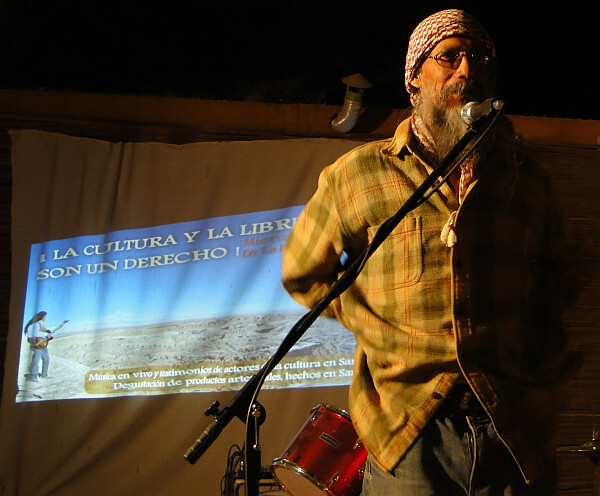 This novel will be presented all around South America, in Antofagasta, San Pedro de Atacama, Arica and Santiago (Chile), in Lima ( Peru), in México (Mexico), and in Bogota (Colombia). 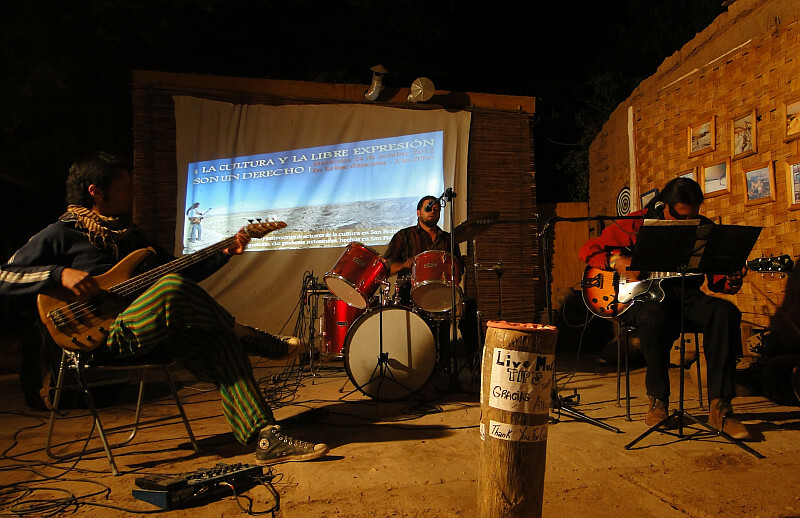 At 8:30 PM // Free entrance. 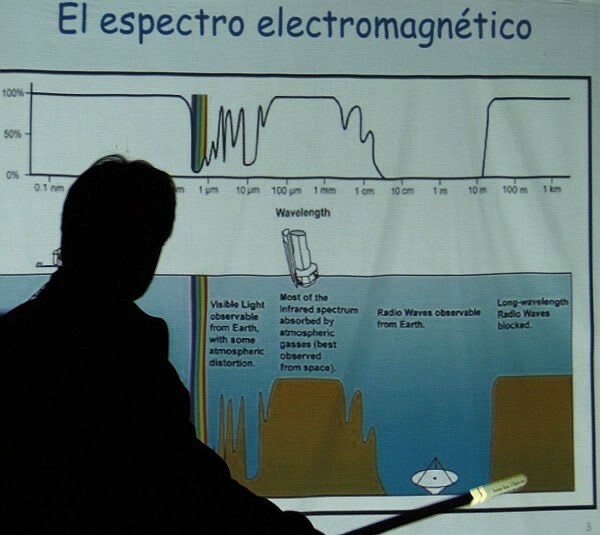 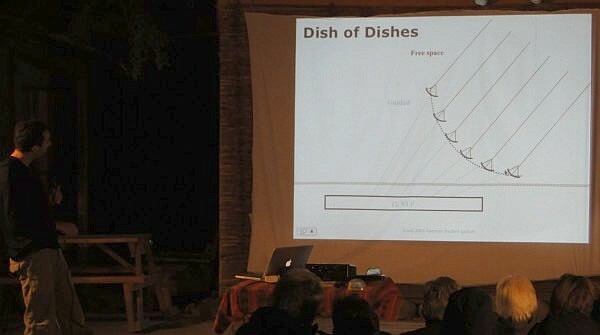 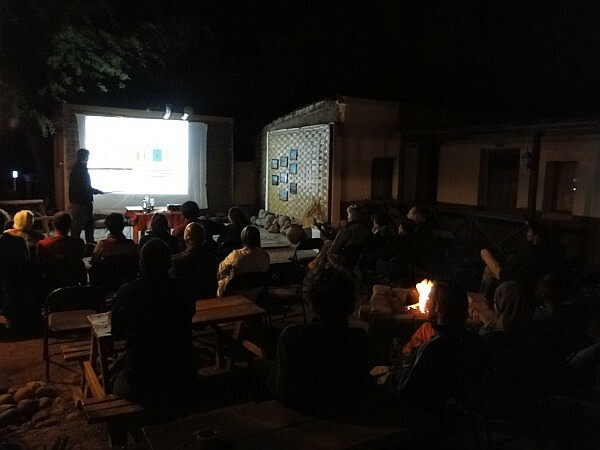 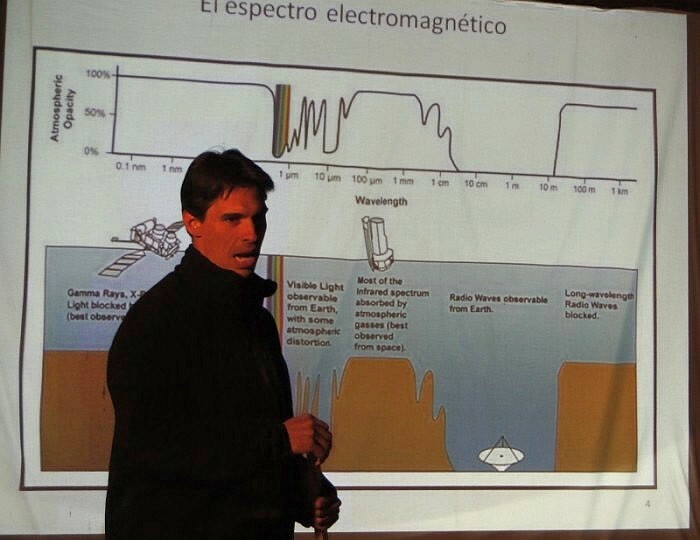 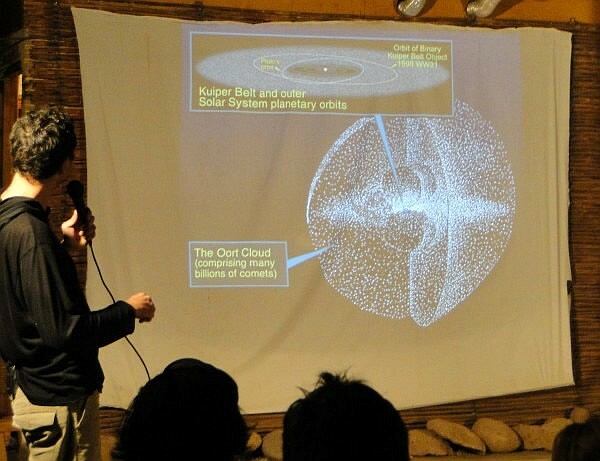 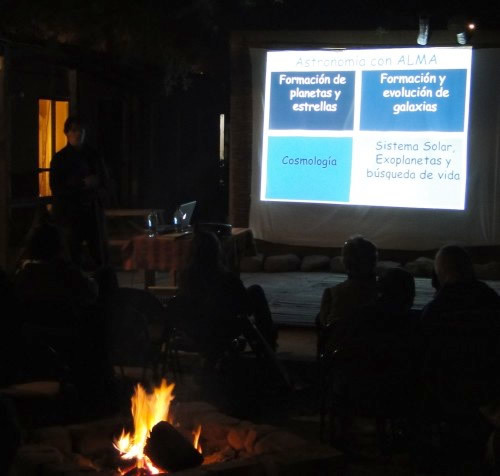 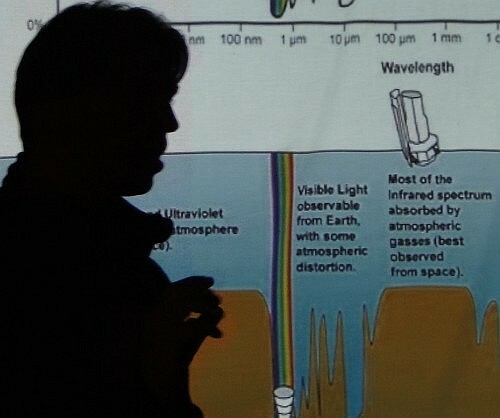 La Rose d'Atacama is grateful for Cecilia Pineda Guerrero and Osvaldo Antilef on the initiative and the organization of this conference, as well as the Professor Christian Nitschelm for his time and his passion in the transmission of his astronomic knowledge. 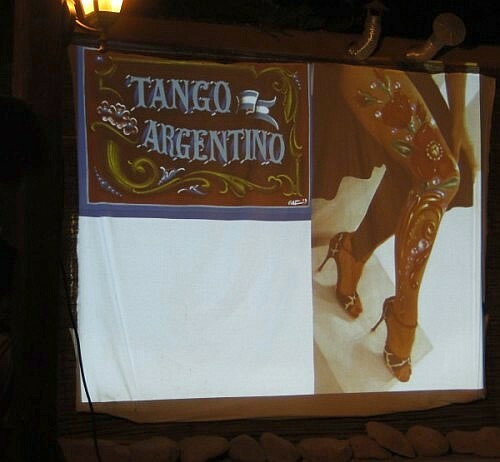 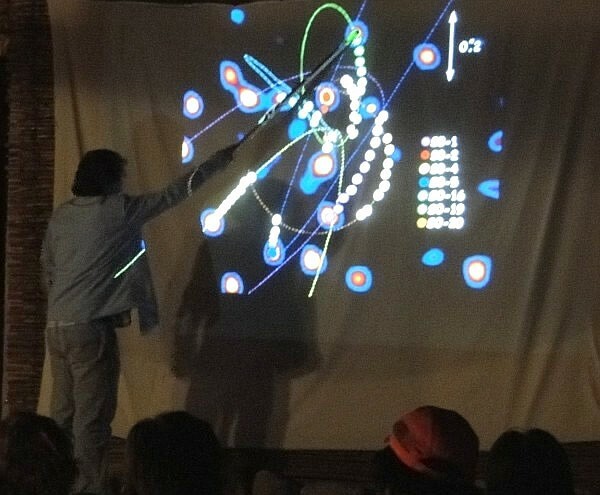 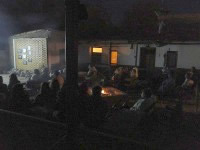 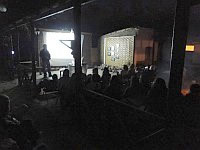 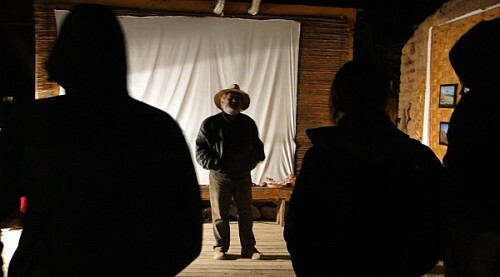 Projection of a documentary and presentation of the artist's work. 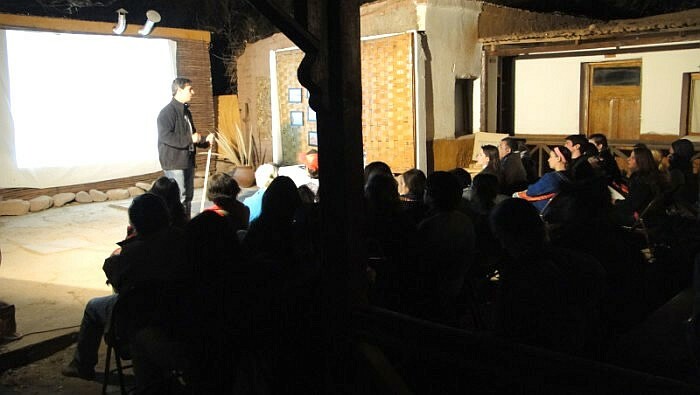 7:30 PM // Free entrance. 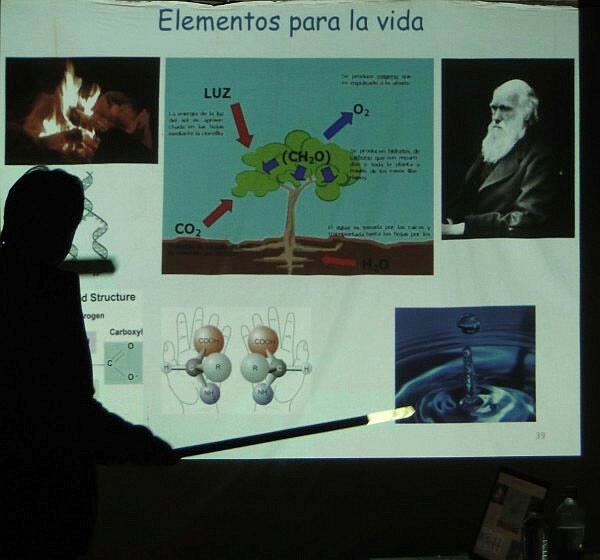 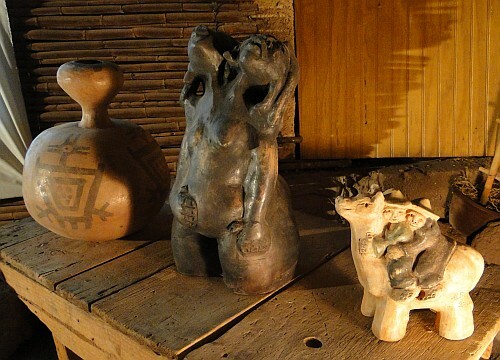 « In the evolution of pre-colombian history, the earth and the fire were essentials elements of culture. 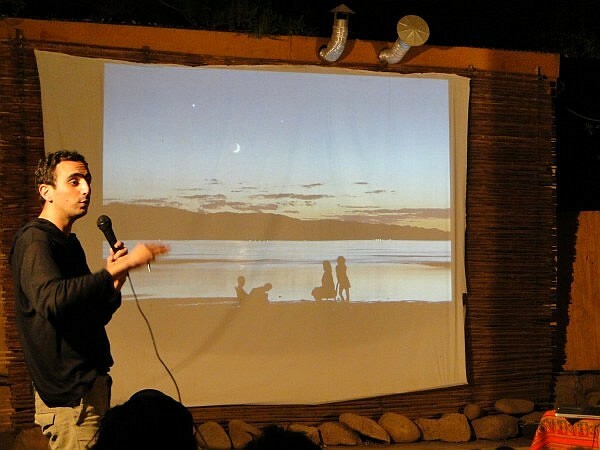 Engineer student inthe university of Agronomy and Food industries of Nancy, Julien Barbier traveled all along Chile with his paramotor (motorized paragliding). 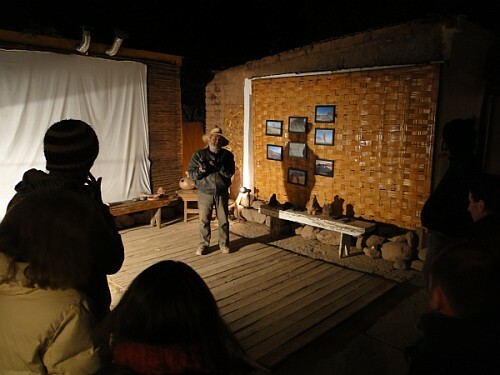 His objective: take air photographs of the various regions of the country and lean on these photographic supports to make a study about towns and countrysides planning and the sustainable development in Chile.